Kevin Lowenwirth is our new Cleanup Coordinator. He’s been very busy organizing our cleanup supply shed, which is now located in the parking lot of New City Bowl. It will soon be filled to the brim with grabbers, bags, wipes, t-shirts, totes and more. Kevin will make sure you have all the information, tools, and support you need for a successful cleanup. 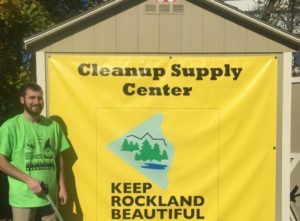 Contact him at cleanups@keeprocklandbeautiful.org.